고려 목종 때의 승려인 홍법국사의 탑으로, 충청북도 중원군(현 충주시)의 정토사 옛터에 있던 것을 1915년에 경복궁으로 옮겨 왔으며, 현재는 국립중앙박물관에 소장되어 있다. 홍법국사는 통일신라 말부터 고려 초에 활약하였던 유명한 승려로서 당나라에서 수행하고 돌아와 선(禪)을 유행시켰으며, 고려 성종 때 대선사(大禪師)를 거쳐 목종 때 국사(國師)의 칭호를 받았다. 기단(基壇)은 네모난 바닥돌을 깐 후에 8각의 아래받침돌을 놓고, 그 위로 엎어놓은 연꽃무늬가 새겨진 높직한 괴임을 두어 가운데받침돌을 올린 후 다시 윗받침돌을 얹어 놓은 모습이다. 가운데받침돌에는 구름을 타고 있는 용이 섬세하게 조각되어 있고, 윗받침돌에는 아래와 대칭되는 솟은 연꽃무늬가 새겨져 있다. 이 탑에서 가장 특징적인 것은 탑신(塔身)의 몸돌로, 둥근 공모양을 하고 있다. 몸돌에는 공을 가로·세로로 묶은 듯한 십(十)자형의 무늬가 조각되어 있으며, 그 교차점에는 꽃무늬를 두어 장식하고 있다. 지붕돌은 별다른 장식은 없으나 여덟 곳의 모서리마다 꽃조각을 둔 것이 눈에 띄는데, 아쉽게도 대부분이 없어져 버렸다. 삿갓 모양으로 깊숙이 패인 지붕돌 밑면에는 비천상(飛天像)이 조각되어 있다. 전체적인 구성에서는 8각형을 기본으로 하는 신라의 탑형식을 잃지 않으면서 일부분에서 새로운 시도를 보여준 작품으로, 제작연대는 고려 현종 8년(1017)이다. 공모양의 몸돌로 인해 ‘알독’이라고 불려지기도 한 이 탑은 새로운 기법을 보여주는 고려시대의 대표적인 탑으로, 섬세한 조각과 단조로운 무늬가 잘 조화되어 부드러운 느낌을 주고 있다. 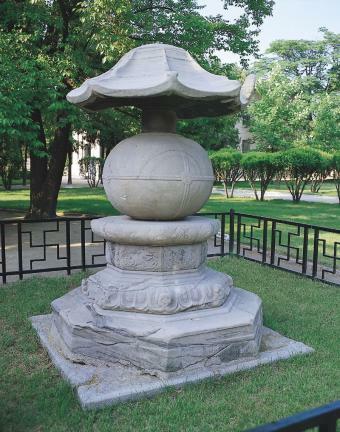 This reliquary monument, set up to honor eminent Goryeo monk and State Preceptor Hongbeop, had originally been located at a Buddhist temple called Jeongtosa in Jungwon-gun (today’s Chungju), Chungcheongbuk-do but was moved to Gyeongbokgung Palace in 1915 and, finally, to its current location in the National Museum of Korea in Seoul. Hongbeop was an eminent spiritual leader for the Korean Buddhists in the 10th century, introducing them to Seon (or Zen) Buddhism that he had studied in Tang. He was given the honorable title “State Preceptor” (Guksa) after “Great Seon Master” (Seonsa) when Goryeo was under the reign of King Seongjong (981-997). The stupa features a foundation consisting of a square slab supporting an octagonal base and a three-tier pedestal whose lower pedestal is shaped like a down-turned lotus blossom; the octagonal middle pedestal is elaborately carved with dragons flying between clouds, and the upper pedestal is shaped like an upturned lotus blossom. On the pedestal is a spherical stone carved with ropes tying the stone sphere crisscross with floral motifs placed on the spots where the ropes intersect. The roofstone is comparatively simple, with no significant ornamentation except the “corner flowers,” most of which are now missing. Under the roofstone are heavenly maids carved in relief. As a work built in 1017 when Goryeo was under the rule of King Hyeonjong (r. 1010-1031), the stupa had introduced some new elements even as it also maintained the style of Silla stupas characterized by an octagonal structure. 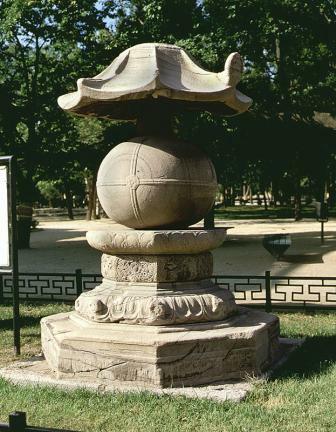 With fine balance and harmony between new and old techniques and elements and use of a spherical stone for its main feature, the monument is widely considered one of the most valuable stupas erected during the Goryeo period.